Topics: Why Choose Us, References, Compare Us, Property Owner Expectations, and Rental Marketing Plan. aampm.com AAMPM Current Orlando home rentals and Condos for Rent in the ..
aampm.com AAMPM - What Property Owners can Expect from All American Property ..
aampm.com Compare Us to Other Orlando Property Managers - All American ..
Its 1 nameservers are ns.aampm.com. Godaddy.com Inc (Arizona, Scottsdale) is the location of the Apache/2 server. 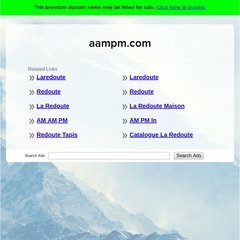 Aampm.com's server IP number is 208.109.254.210. PING (208.109.254.210) 56(84) bytes of data.